Week 4 Results of Hi Ho Books Away! 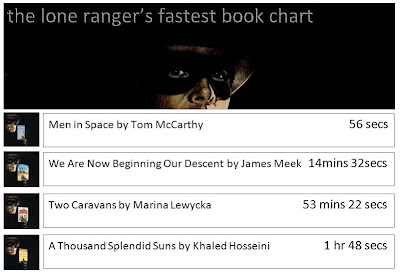 I arrive on my fiery horse at the speed of light and in a cloud of dust set the book down on the bench. I sit waiting for the best time to make my get-away when I feel something touch my boot. I look down and see a rabbit. Strange. Leaving the book, I make my way to my vantage point and wait. A man glances at the book, then sits with his back to it. After a few minutes he leaves. A man in a flat cap shuffles towards the bench and picks up the book. He looks through and then sets it down again. He takes a few steps away and stops for a moment. Some internal gears shift and he walks behind the bench and reaches over the back and picks the book up again. He ambles off to the drinking saloon looking at the book. My mission complete I return to Silver. On the way past the saloon I spot him again with a pint in his hands. The book is nowhere to be seen. 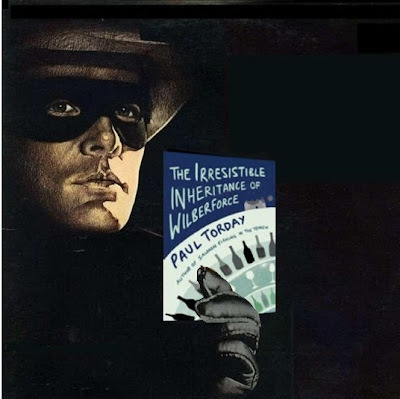 Next week: The Irresistible Inheritance of Wilberforce by Paul Torday. Let us hope that the only reason the man who picked up the book was seen without it later is because he found it so good he thought whoever dropped it would want it back and left it at a lost and found. I admire your determination, partner. Ooh, and thanks for changing my pic. I've only read one review of James Meeks' book. But if I "found" it unattended for a few minutes, it would take front and center in personally library--after I read it and most likely reread it. Brigid: With the other lost & found items in the drinking saloon? Like a colt45 and riding spurs? I once found Tonto in the lost & found at Wild Marys. Stella: "Ooh, and thanks for changing my pic." - No idea what you are talking about? KathleenMaher: I thought about following the guy in, but after your recent comments about getting picked up, I decided against it. Paul Burman: Very good. Would you be interested in writing the screenplay for my new series for ABC? They haven't bitten since 1957. Oh I beg your pardon. That comment was meant for someone else. No offense, man.